"At What Cost? ", a short film about the demise of a 100-year-old pecan grove in the center of Austin, debuts today on the internet. The film, by Tom Suhler, takes the form of an obituary for one of the 50 trees that were toppled to make room for the Barton Place Condominiums. I've owned land; I believe in property-owner's rights. But once I started documenting the land-clearing I was surprised how much the take-down affected me and those of other Austin residents. So I put this piece together to try to resolve some of those feelings. "I don't consider myself an environmental activist," says Suhler. "I've owned land; I believe in property-owner's rights. But once I started documenting the land-clearing I was surprised how much the take-down affected me and those of other Austin residents. So I put this piece together to try to resolve some of those feelings." Distilled from video and over 1500 still photos, the film takes the form of a fictional obituary for one of the trees cut down on May 21. The deceased takes her name from "baum," German for tree and verde, which is "green" in Spanish. The accompanying website, http://www.atwhatcostthemovie.com was devised to accommodate some of the research that didn't fit the format of the film itself. There's a tree survey that shows what the site looked like before and after the clear-cutting and there's a link to the site plan that was filed with the city. There's also a page where others can share their thoughts on the clear-cutting and its long-term implications. This is not Suhler's first exploration into contentious areas. His short film, "Conflict in the Hood" explores various issues people face on a daily basis when living in close proximity. The three- minute short was created for the "Filming Austin Lives" project, sponsored by University of Texas Humanities Institute, public television station KLRU, the Austin History Center, and News 8 television. 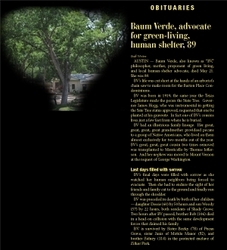 The film was chosen as one of the 2006 winners and has been selected for use in a Duke University conflict- resolution class. SideSpin Productions creates, develops and participates in film and video projects from its offices in Austin, Texas. They offer a wide array of services: concept development, production, post-production and direction services - supported by a marketing effort that includes traditional channels with web-based promotion. For more information, visit http://www.sidespinproductions.com.